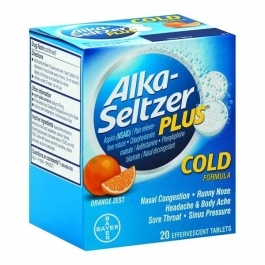 Alka-Seltzer Orange Cold Formula offers temporary relief for minor aches and pains, headache, runny nose, sinus congestion and pressure, cough, sneezing, sore throat, nasal congestion, and temporarily reduces fever. Pregnancy/breast-feeding warning If pregnant or breast-feeding, ask a health professional before use. It is especially important not to use aspirin during the last 3 months of pregnancy unless definitely directed to do so by a doctor because it may cause problems in the unborn child or complications during delivery. When using this product alcohol, sedatives, and tranquilizers may increase drowsiness,do not exceed recommended dosage,excitability may occur, especially in children,be careful when driving a motor vehicle or operating machinery.,may cause marked drowsiness,avoid alcoholic drinks Ask a doctor before use if you have high blood pressure, heart disease, liver cirrhosis, or kidney disease,persistent or chronic cough such as occurs with smoking, asthma or emphysema,a breathing problem such as emphysema or chronic bronchitis,a sodium-restricted diet.,you have asthma, diabetes, thyroid disease, glaucoma, cough with excessive phlegm (mucus),you are taking a diuretic,you have a history of stomach problems, such as heartburn,Ask a doctor before use if stomach bleeding warning applies to you,difficulty in urination due to enlargement of the prostate gland Stop use and ask a doctor if ringing in the ears or a loss of hearing occurs,new symptoms occur,pain, cough, or nasal congestion gets worse or lasts more than 7 days,redness or swelling is present,fever gets worse or lasts more than 3 days,nervousness, dizziness, or sleeplessness occurs.,feel faint, vomit blood, have bloody or black stools, have stomach pain that does not get better Ask a doctor or pharmacist before use if you are taking sedatives or tranquilizers.,Ask a doctor or pharmacist before use if you are taking a prescription drug for gout, diabetes, arthritis Reyes syndrome Children and teenagers who have or are recovering from chicken pox or flu-like symptoms should not use this product. When using this product, if changes in behavior with nausea and vomiting occur, consult a doctor because these symptoms could be an early sign of Reye's syndrome, a rare but serious illness. Other warnings Do not use if pouch is torn or open. Stomach bleeding take other drugs containing prescription or nonprescription NSAIDs (aspirin, ibuprofen, naproxen, or others),This product contains an NSAID, which may cause severe stomach bleeding. The chance is higher if you are age 60 or older,have had stomach ulcers or bleeding problems,take more or for a longer time than directed.,have 3 or more alcoholic drinks every day while using this product,take a blood thinning (anticoagulant) or steroid drug Allergy allert hives,shock.,facial swelling,asthma (wheezing) Do not use in children under 12 years of age.,if you are allergic to aspirin or any other pain reliever/fever reducer,if you are now taking a prescription monoamine oxidase inhibitor (MAOI) (certain drugs for depression, psychiatric, or emotional conditions, or Parkinson's disease), or for 2 weeks after stopping the MAOI drug. If you do not know if your prescription drug contains an MAOI, ask a doctor or pharmacist before taking this product,if you have ever had an allergic reaction to this product or any of its ingredients Sore throat warning If sore throat is severe, persists for more than 2 days, is accompanied or followed by fever, headache, rash, nausea, or vomiting, consult a doctor promptly. Do not use to sedate children.